Here is the list of records shattered by Alastair Cook in his last innings. 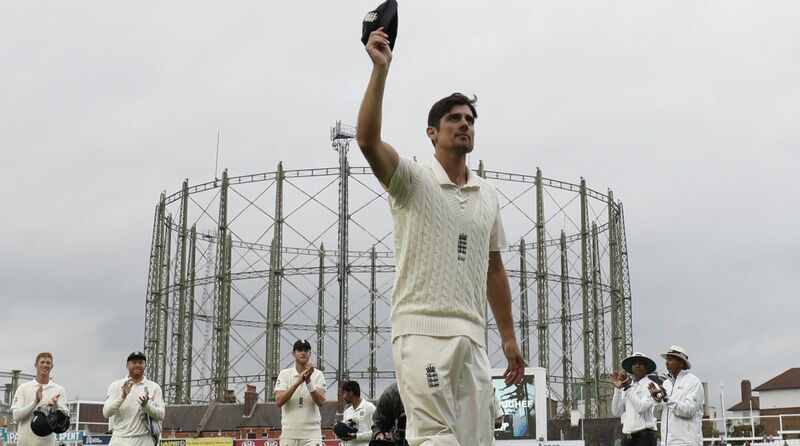 Former England captain Alastair Cook played his final international Test match on Tuesday. Cook scored 147 in his last innings as England won the last Test match by 118 runs. The 5th Test match was played at the Kennington Oval in London. Alastair Cook made his debut in the longest format of the game in 2006 against India in Nagpur and he also played his last innings against the same team. Cook wore England’s jersey for 161 Test matches and scored 12,472 runs with the help of 33 Test centuries and 57 fifties. 1- The 33-year-old English man is now the highest run-getter among left-handed batsmen. With 12,472 runs, Cook went past Kumar Sangakkara’s 12,400 runs on Monday. M Leyland with Len Hutton vs Australia, Oval, 1938 – 382 runs. Jason Gillespie with Michael Hussey vs Bangladesh, Chittagong, 2006 – 320 runs. Alastair Cook with Joe Root vs Ind, Oval, 2018 – 259 runs. Aravinda de Silva with Sanath Jayasuriya vs Colombo PSS, 2002 – 234 runs. 3 – Alastair Cook is the fourth on the list of batsmen involved in highest century partnerships in Test. 5 – Indian skipper Virat Kohli is now first and third on the list of batsmen with most runs while playing for a losing side in a Test series. Virat Kohli vs Aus, 2014/15 – 692 runs. Mohinder Amarnath vs WI, 1982/83 – 598 runs. Virat Kohli vs Eng, 2018 – 593 runs. Mohinder Amarnath vs Pak, 1982/83 – 584 runs. Gundappa Viswanath vs WI, 1974/75 – 568 runs.